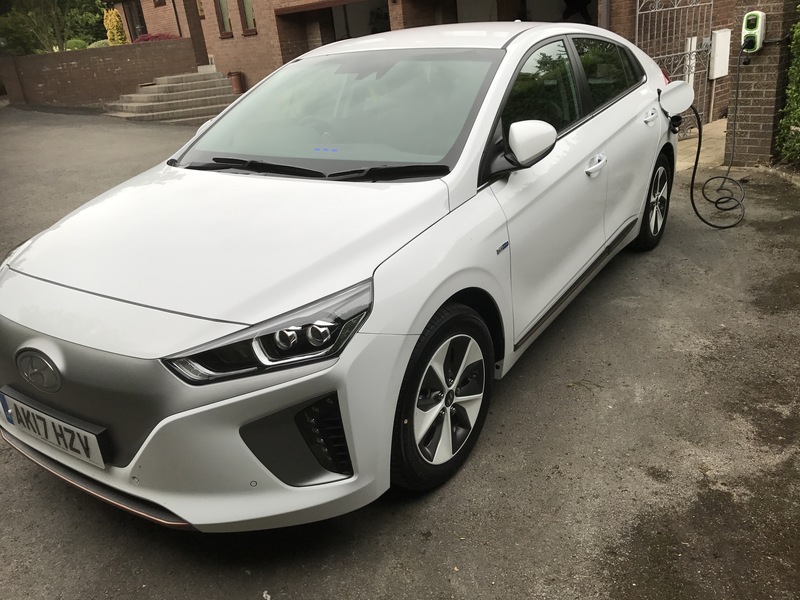 First impressions of our new Huyandai Ioniq. 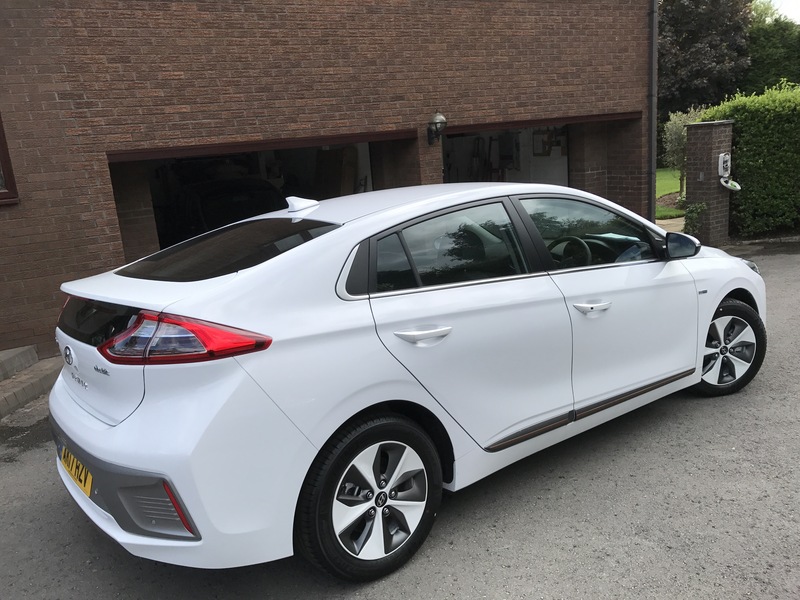 Finally the car arrived today and I am very impressed.It was fully charged and showed 130 miles in range.The seats are comfortable front and back.Interestingly no gear lever but 3 different buttons for changing from P to Drive and reverse.Another button for the Parking brake?Why do I need a power button?Why do I need to power the car on and off? A little too many buttons coming from a car which only has three buttons. Very smooth ride on A roads and also in town and on dual carriageways.From 75 miles to 130 in 2 1/2 hours charge on 7kw charger – not bad.Big boot space and big space in the bag.Love the golden stitching and trim around the leather and some of the console area.The blind spot warning in the mirror is great., but I find some of the functions not very easy to turn on and off.Need a bit of practice.Satnav great!Love the different options for chargers.Search by network or by adapter or by type of charger rapid or slow etc.Even got speed camera warning built in. What the heck does the boot button do on the key remote?No lifting tailgate.Just for locking the boot? Grey plastic front looks better than on demo car. Key fob looks nice and expensive and also happy that two are supplied. Keyless entry the same as copied from Toyota .You have to press button on front doors to unlock and lock car.Progress over pressing remote?Not sure. 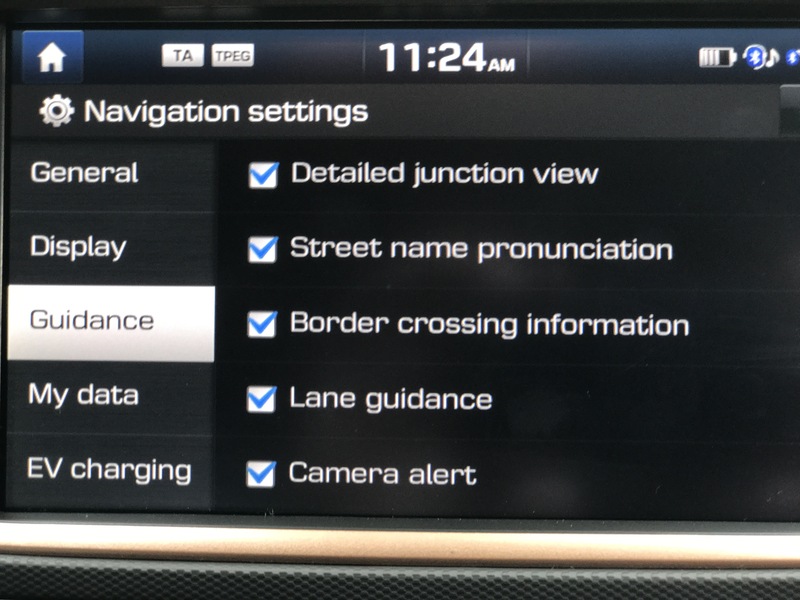 Like the automatic folding of mirrors and the automatic dipping of mirrors for reversing.Like the grid on the rear camera view.Good angle and very clear view. 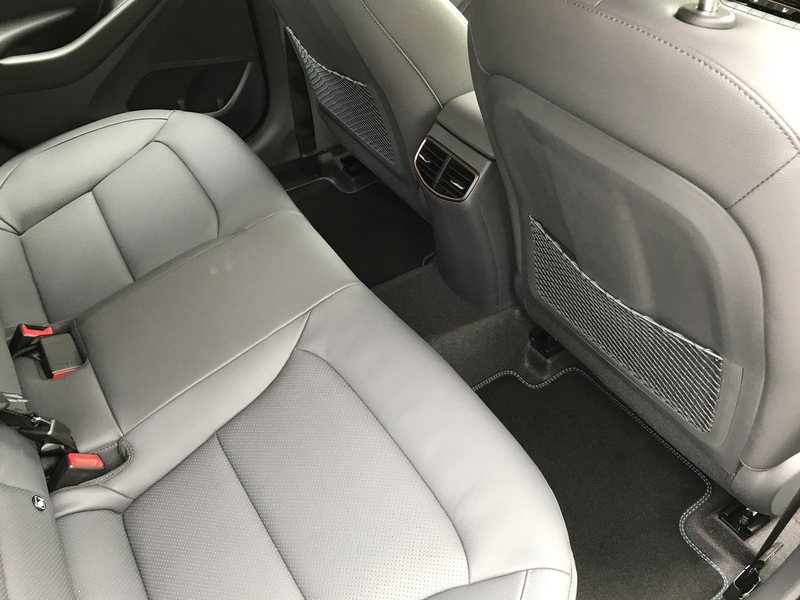 Like the automatic seat sliding backwards when driver’s door is opened. Questions: Not seen a built in Alarm mentioned anywhere.Can’t see any ultrasonic sensors inside the car?Not seen anything in settings. 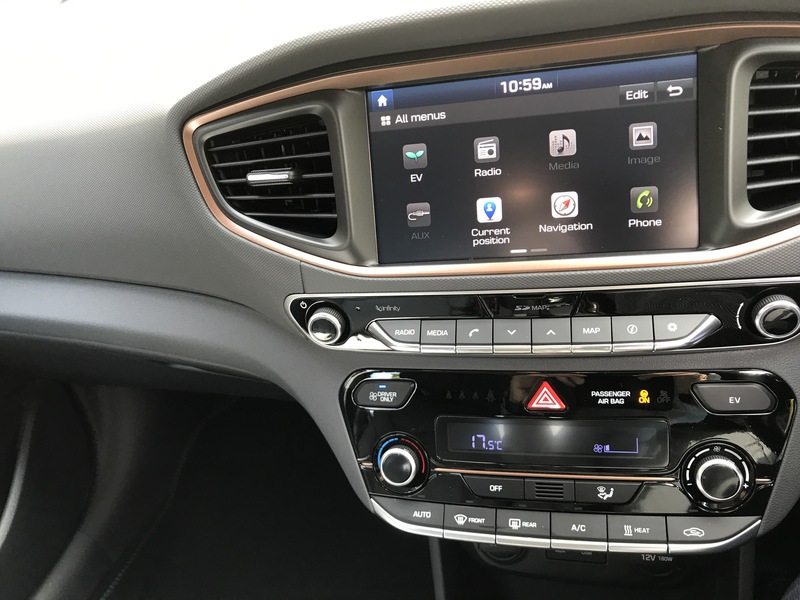 Apple Carplay only via USB cable-very strange? Why is the passenger seat completely manual.Sorry Hyundai this is a little stingy for £30,000 and top of the range model. For the first time on my regular trip to Wales there was no charging pit stop available in Warrington.Oh dear what to do and with an 82 year old in tow? Well Chademo it is.But first I tried to have a rest at the Warrington hotel and charge up with the type 2 cable.Very slow but least we could continue until well into Wales. First Chademo pit stop in Wales with the Chademo adapter.I was prepared to pay £6 per half hour as these are the new charges imposed by Ecotricity (don’t get me started! 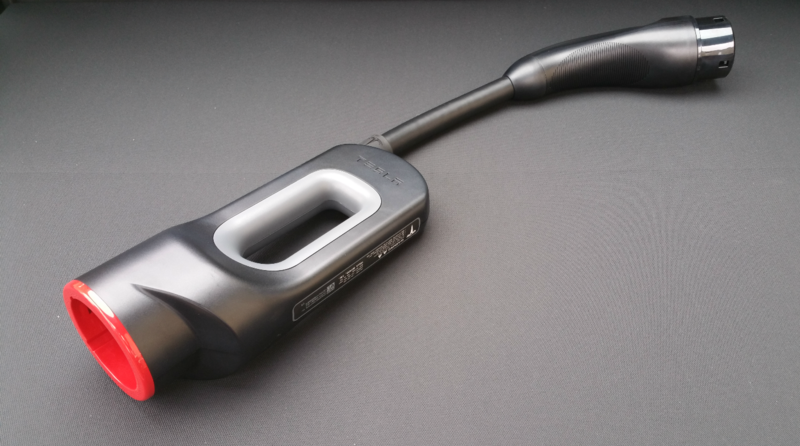 ).So smooth as anything Cherokee adapter connected to Chademo pistol grip and adapter into car charge point.Everything working! Now get the IPhone app fired app and wait for the pennies to be deducted and nothing…..free? Well it looks the app crashed and the machine has no connectivity to Internet! First free charge.But what on the way home? 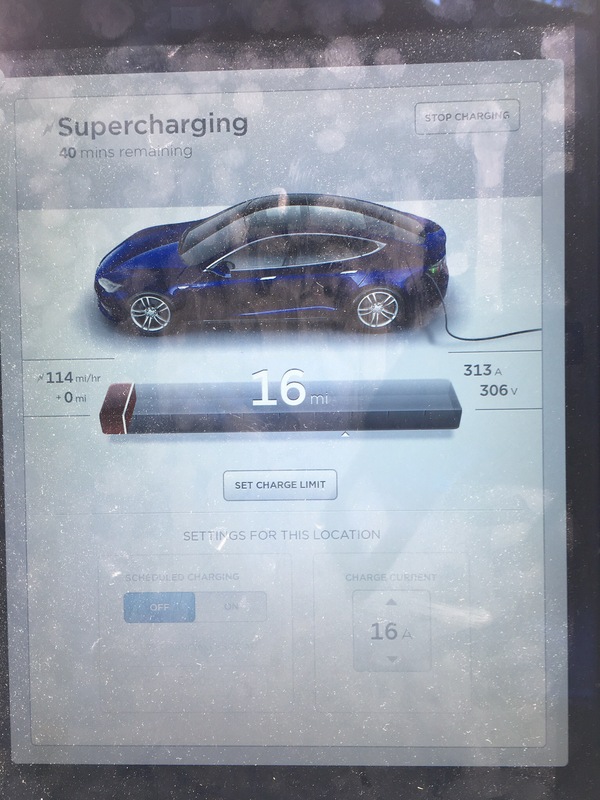 Well I calculated that if I would take the last A55 Chademo charger I would make possibly to Leeds supercharger, but no such luck.Just out.But what is this.No charge again.Error message no connectivity but it’s charging! 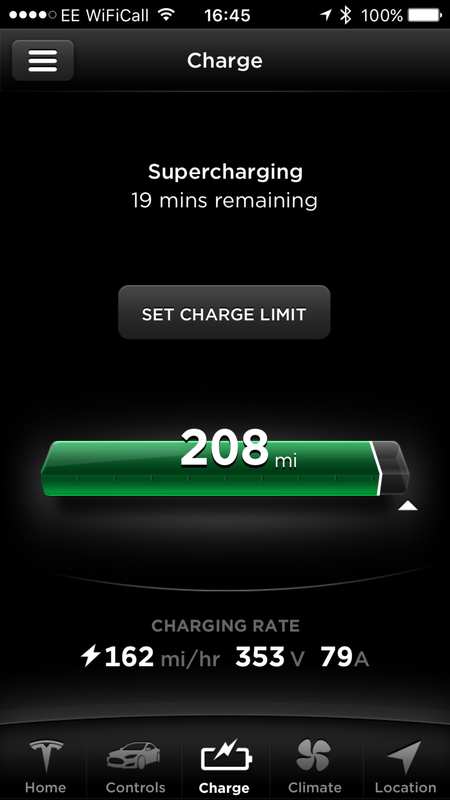 Well I am on 206 miles now and no charge but lots of Electrons!!! Thank you Ecotricity.I can go home now!Just need to fight my way through the traffic now!Not looking good on A55 and M56 but ok on M6. Watch this space how I get on! 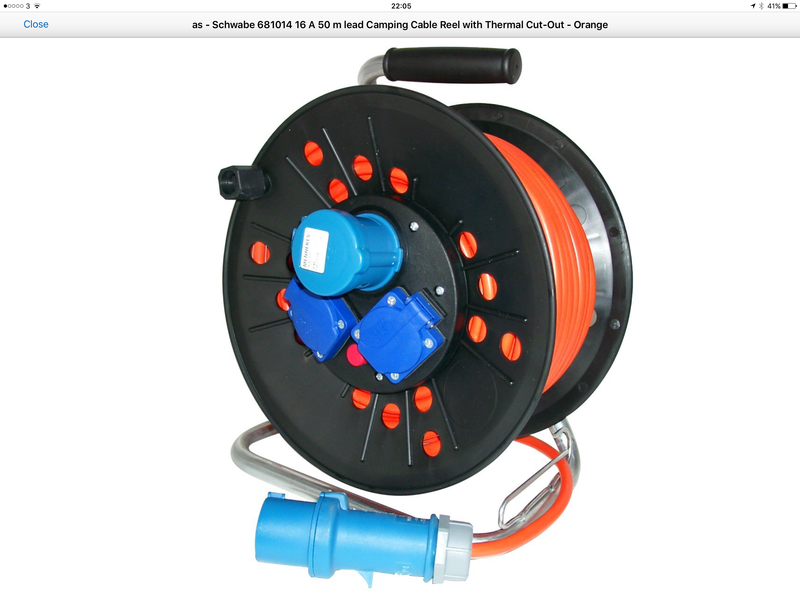 What Cable for what Charge point? 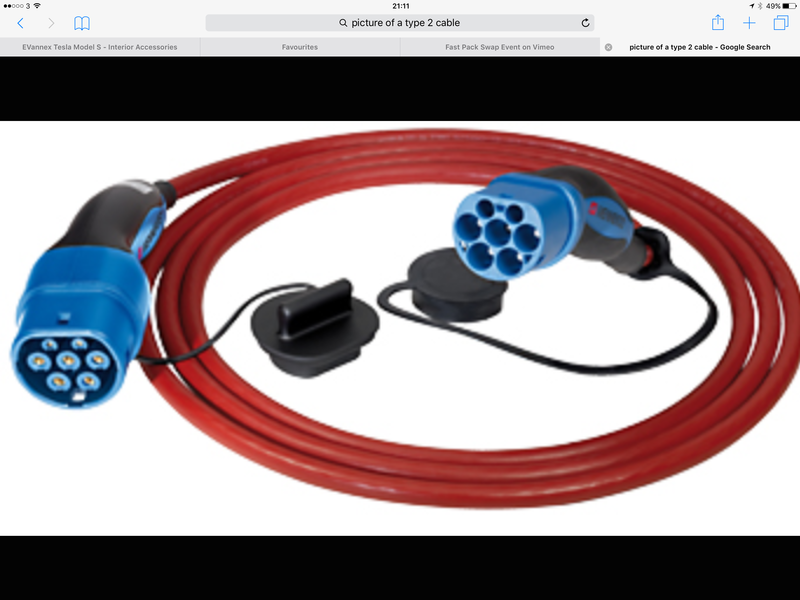 I will try and explain which cables are for which charge point that you come across when you are out and about.I have already explained which cables and adapters I carry.Here I will put them in context.This is a guide for Tesla owners and for owners of other cars like Citroen C-Zero, Renault Zoe and Nissan Leaf cars. 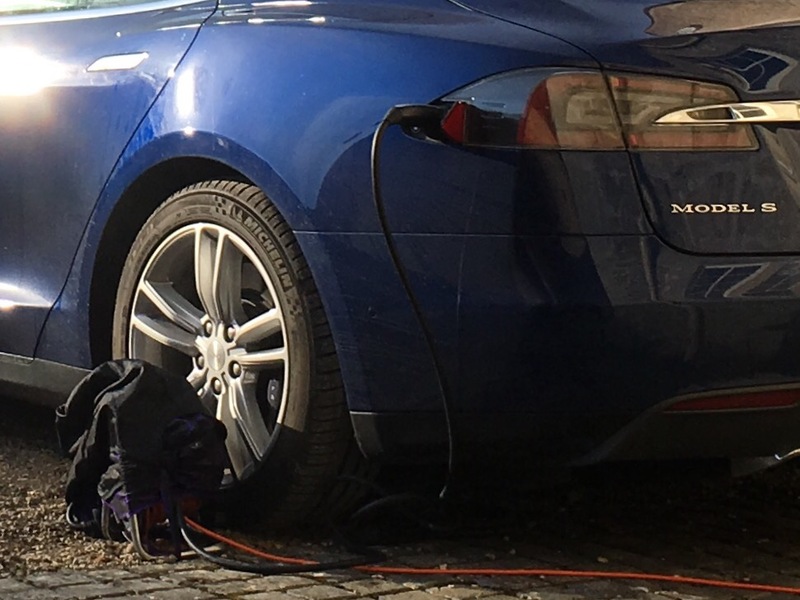 The cable that you need to connect your car to a Supercharger is an integral part of the Tesla charge point .The cables need to be very thick.They deliver 90 kW or 90,000W. 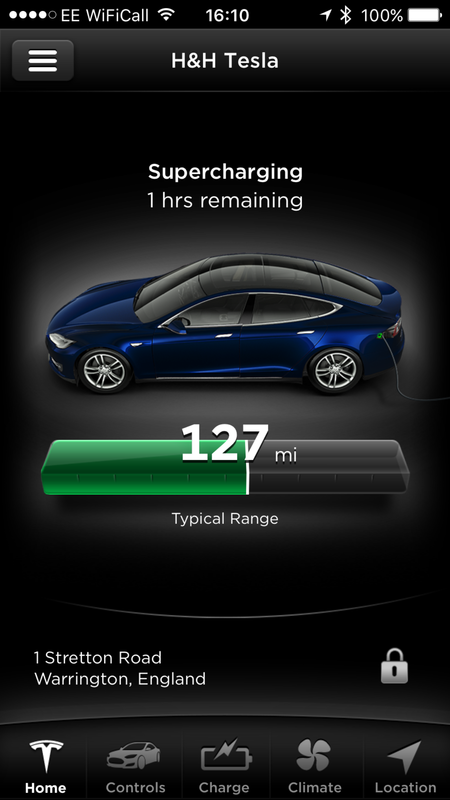 A Tesla can be charged by a Tesla Supercharger in about 60-90minutes from 0 to 250 miles.NO other car but a Tesla (as of August 2016) can charge at Supercharger. For a Tesla to charge at a Chademo charger you need an adapter as the Tesla has a type 2 Socket which is much smaller. Chademo chargers plugs are huge.Chademo chargers are the 2nd fastest charge points and are giving out about 50kwh and can charge a car at 100 miles per hour.These chargers are dotted around the country and you need zapmap or Plugshare to find them.They are coloured orange on Plugshare and purple on Zapmap.You find them also on Motorway service stations.Ecotricity have started as of August 2016 to charge at £6/hour.However the Genie network in the Lake District are charging less.Chademos are fitted with their own cable so you don’t need a cable.Chademo chargers usually have 3 power outlets.One is a DC 50KWH CHADEMO plug.The second power outlet is usually a lower capacity AC socket rated at 22kwh or 43kwh.For this you have to use your own Type 2 cable and can usually be used simultaneously. 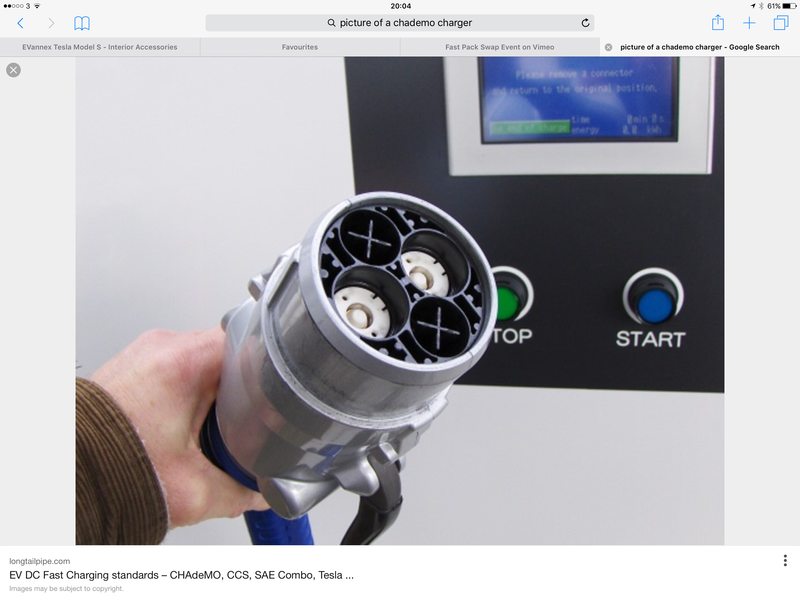 (Please see under 3 what a type 2 cable is).The third power outlet on a Chademo charger is a Connector for a BMW i3 type car. So this is why the Chademo adapter has to be big as well. 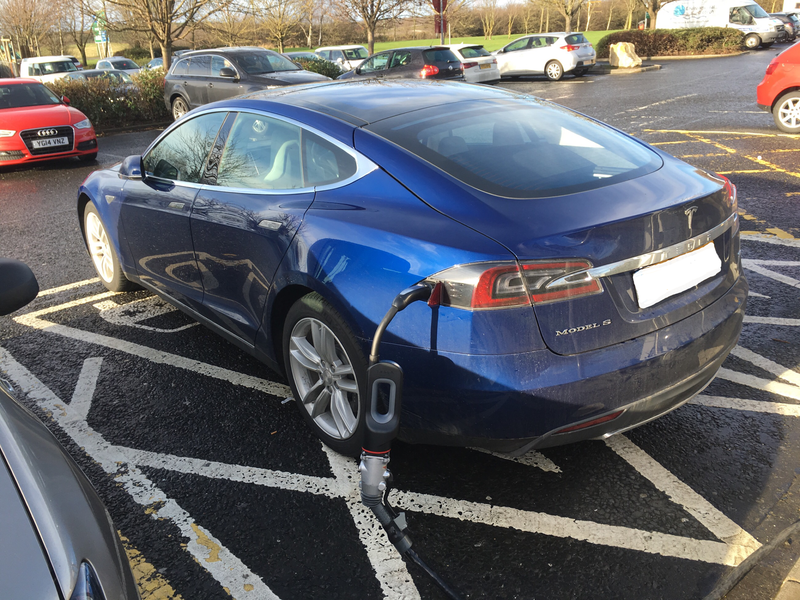 Here we have a Tesla plugged into a Chademo charger at a Motorway Service Station. 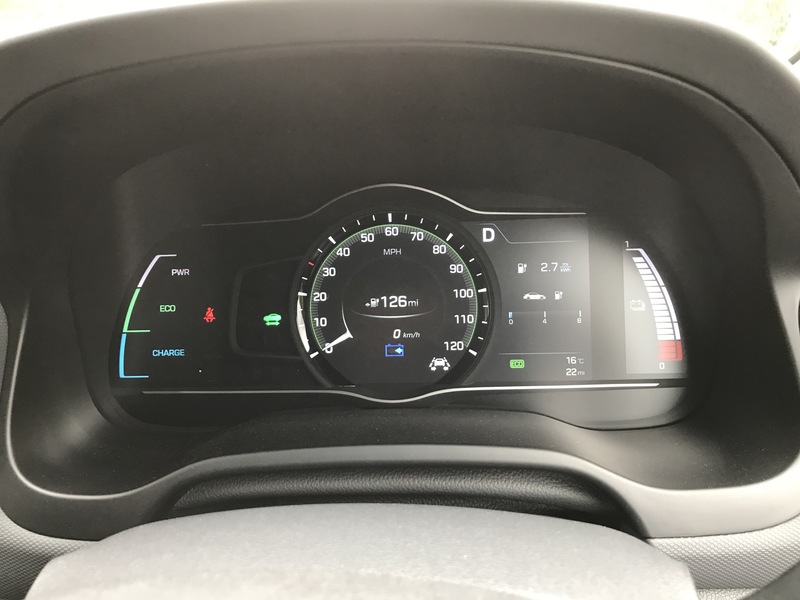 The silver plug that you see, can be inserted into a Leaf or a Citroen C -Zero without an adapter and will fill the car up to full in about 45-60 minutes. 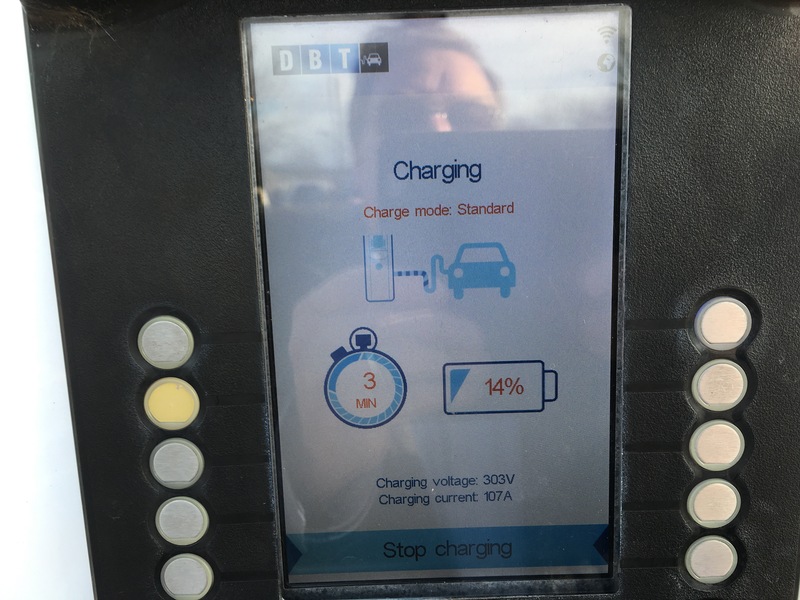 Chademo charging screen at a Chademo charger on the Motorway for Citroen C-Zero and other cars. 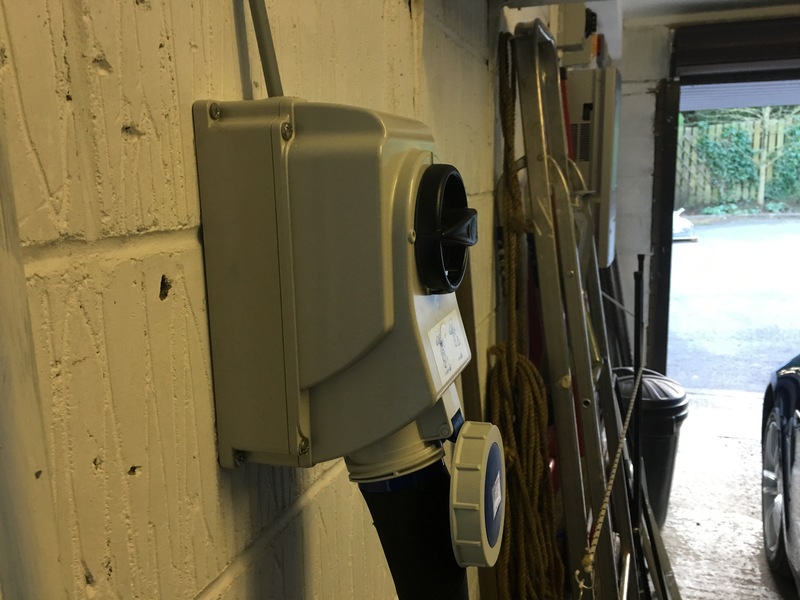 These chargers are called Type 2 Chargers and are usually only providing a charge rate of 7kwh.This means about the same charge rate as at home, so about 10-20 miles per hour.For these you usually need to supply your own type 2 cable. This red cable is a Type 2 cable. Of course the most important part is how do you charge at home.Well with a Zoe, Citroen C-Zero,BMW I3 and Tesla you actually get a home charging point and appropriate cable. 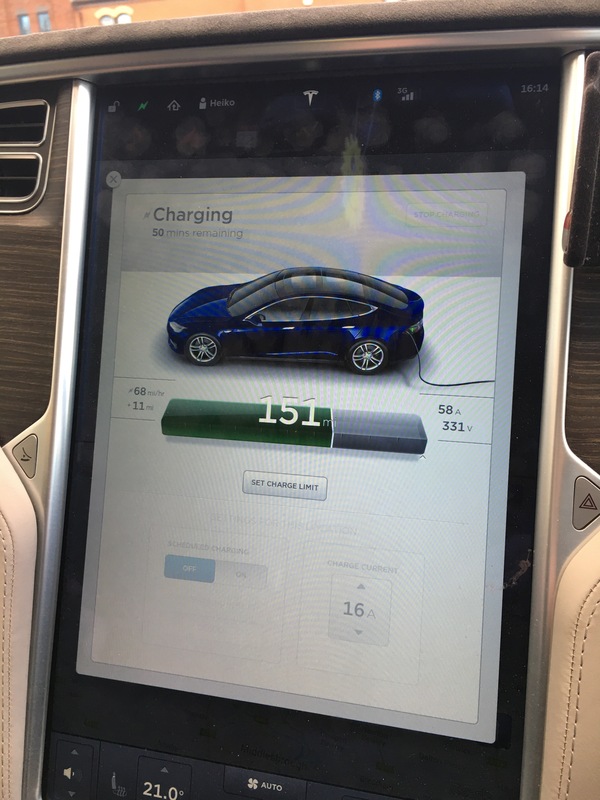 Tesla supplied “command socket” for charging at home. 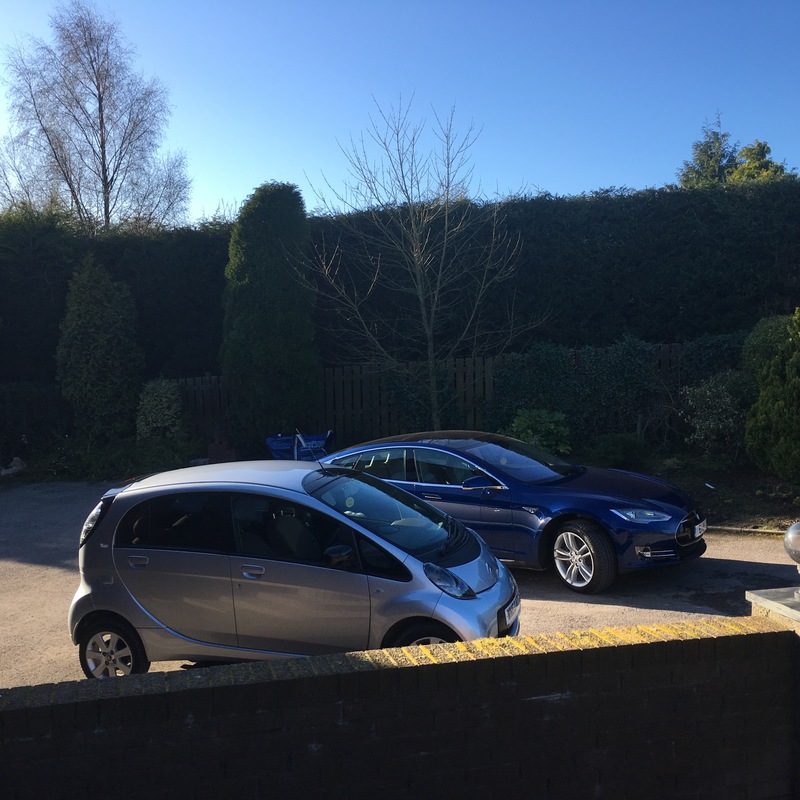 This is the charge point we have chosen for our Citroen C-Zero and both our charge points are put in Garage as both our cars are kept in the Garage over night. These are the cables and adapters I used to charge at a holiday cottage from a 13 amp socket.It will charge at under 10miles per hour. How did we manage with two electric cars and NO petrol being consumed by my wife and I for our commute to work and shopping trips and a few journeys to Somerset, Wales and Lichfield.Quite long journeys from County Durham!None of us did never run out of electricity or needed to be on the back of a tow truck.We always found enough charge points and also found plenty of opportunity to charge the car overnight in a holiday cottage. I even managed to find a B&B with an electric chargepoint designed for electric cars. What did I find essential to take with me on our trips? Smartphone essential kit? I think so because some charger networks are replacing cards with smartphone apps. 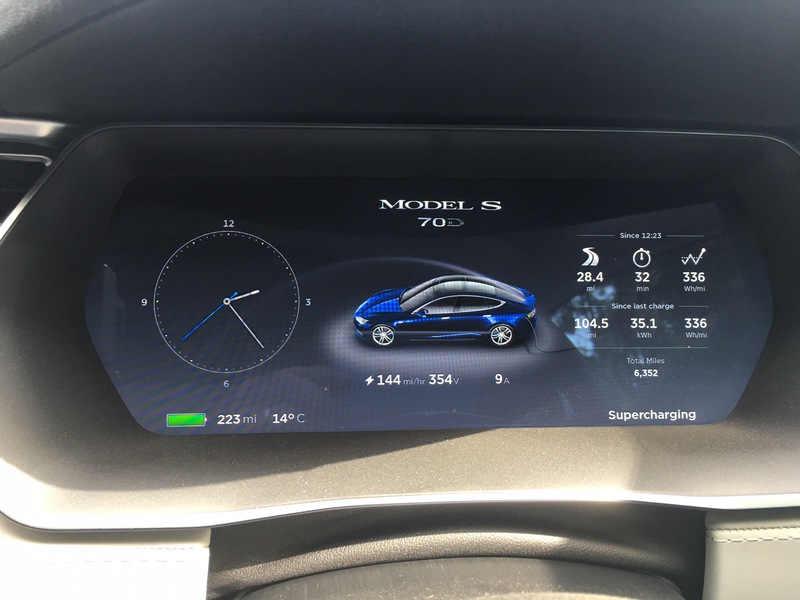 If no Smartphone to hand try http://tesla.plugshare.com/ on your Tesla screen and bookmark it in the Tesla internet browser to find it again. 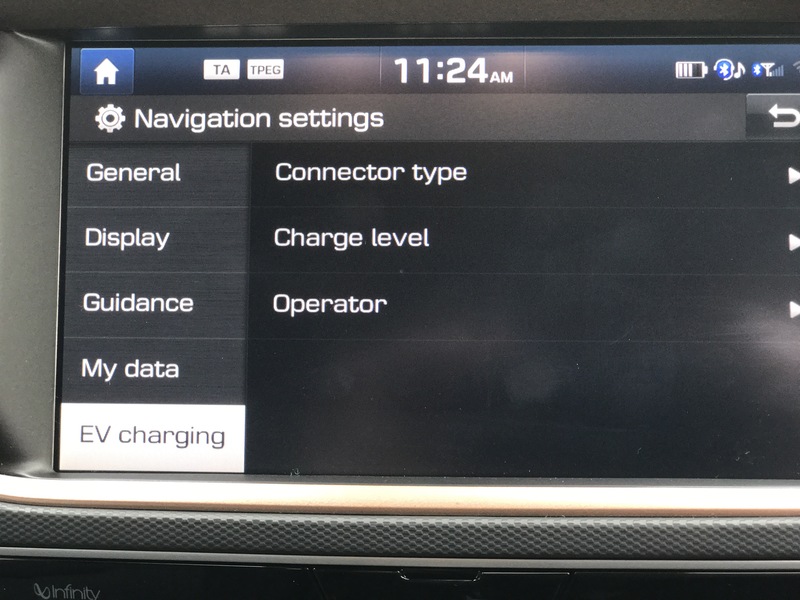 Zap-map for location of all chargers than Tesla own chargers.Filters can be set if you want to know only about chargers for certain cars or networks. “Plug Share” app even shows you “private” charge points where individuals might let you charge your car if they have registered.Also leave comments if possible or check -in. Well I hear you say that will fill up my boot and no space for the kitchen sink?Ah- Of course the Tesla has a Front Boot and you can easily store all the that in there and have plenty of space in the boot for your normal luggage.Our Citroen C-Zero has the Chademo Charger already built into the car and it transpires that it has a second tank flap which opens and you will find the socket in there. What else have I learned? I feel richer, because we have saved a lot of money on petrol and the monthly credit card bill has gone done! I also think we have “saved” time because the car is ready every morning for duty and no unscheduled stops before or after work for “going to the petrol station and waiting in a queue at Tesco”. We also feel enriched because driving to the shops or to the tip is not costing the environment and that gives you a pod feeling.Have I driven more and not walked?No I think we are more active and getting things done in the garden etc.Also shopping trips are a pleasure as ours cars with automatic gears (well one only) is a doddle and the best thing of all: I have no more road rage! 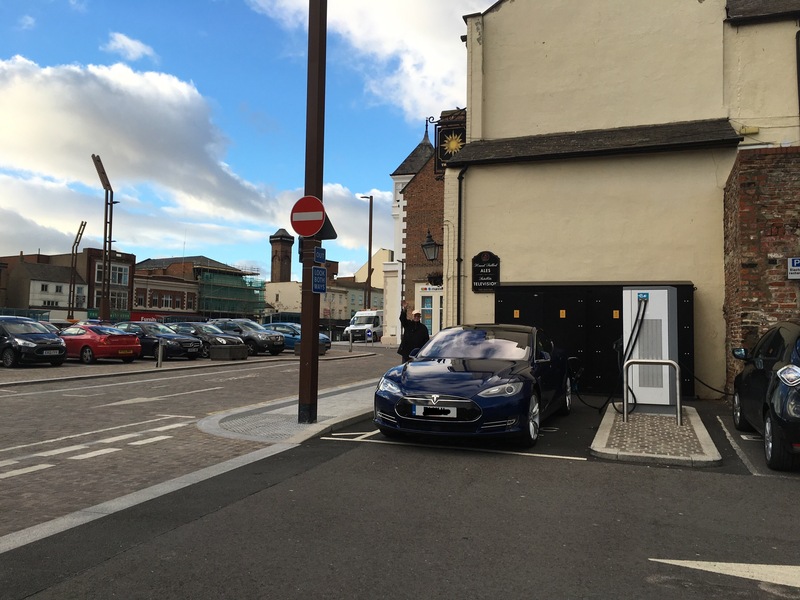 Picture above shows Chademo adapter in Stockton-on-Tees High Street. Oops- Well I could have gone a bit further, but this is close enough! 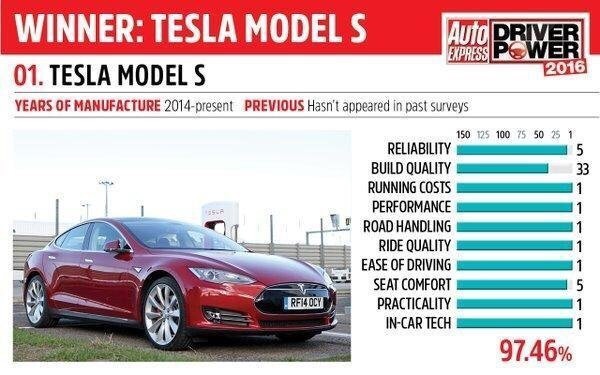 Here on the picture above you can see that Tesla also compares well to other cars on the reliability front, so Tesla have taken all the good bits from European car manufacturing and put that into fully ELECTRIC car. On the picture below you can see how big the Chademo adapter is.Plugged in at Durham Services in County Durham-and no petrol available there at the moment but plenty of electricity-just like in France (May 2016). In closing I want to say that it has been a thoroughly stress free experience and driving a car is fun again in a Tesla! Has any Electric car manufacturer really holistically thought about the whole ecological lifecycle of their products? Where are we getting all that Lithium from we need for the millions of electric cars we want and should produce instead if today’s Ice (Internal combustion engine)cars? One manufacturer of Electric cars (Tesla Motors) have thought about it and I think they are the only ones who have got it right.Here is a documentary that shows what Tesla are trying to achieve in their new GIGAFACTORY in Nevada.From production to Recycling of Lithium and using solar energy for production-surely this must be the future? 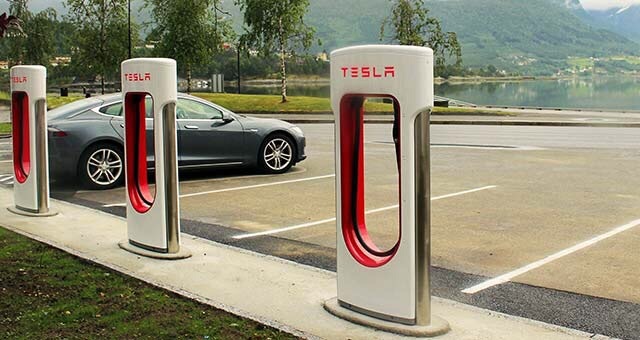 Guess what:they even thought of where and how to charge up your car and build a 5000 strong network of a world wide charge point infrastructure free for any Tesla car owner for life ! Here is one near me just a few hundred yards off the A1/M at exit 64. This is why we in our family are supporting Tesla Motors and have bought a car from them rather than from a traditional Ice Manufacturuer . Did you you know that driving a 100% electric car even if the electricity has been produced by the dirtiest Coal fired power station is still 50% better than driving an ICE car? 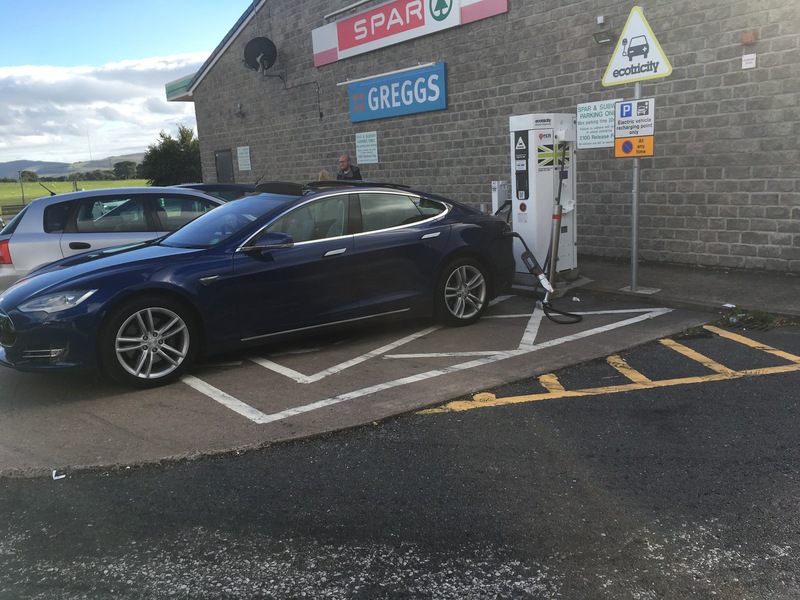 Public Chargers -the good, the bad and the ugly. What is it with people these days?Why do we have to vandalise things.Of course not all of us , but some people in Society seem to think that everything that is standing around and is in a public place is fair game for a kicking. Why am I writing about this?Well I have been on some scouting missions around the Northeast and found several Public charging points not working.I wanted to find out where my wife could charge her Citrien C-Zero on shopping trips in and around Co. Durham and Teesside as this car has only a max range of 50-60 miles. Sainsbury chargers in Sedgefield and Durham not working.Newton Aycliffe charging points in Town Centre removed ( because of constant vandalism-saw them stripped and rundown before being removed).Charging point at Thinford Living Building only to be used for visitors and Employees and it was blocked by a non charging Mitsubishi OUTLANDER PHEV.However the former Sedgefield District council building car park has a charging point that is accessible but AGAIN one of them is broken. 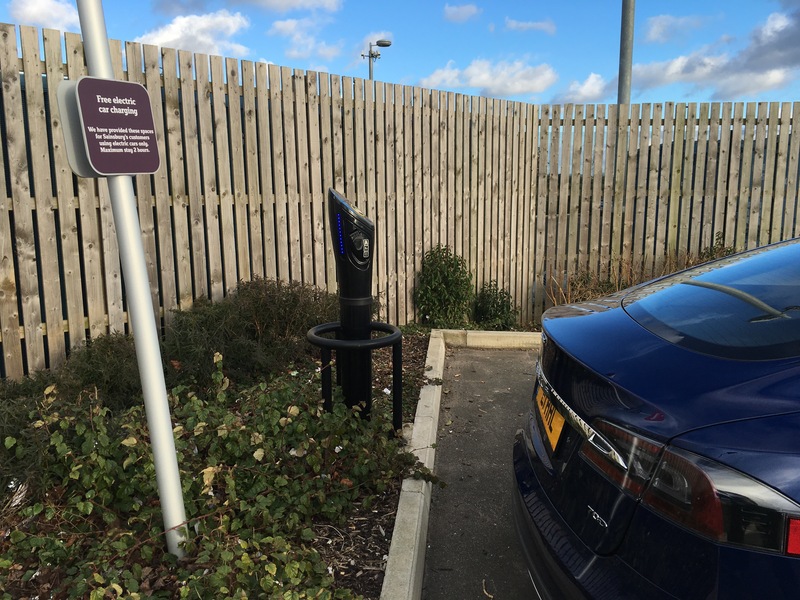 Durham Services 50Kw (50 miles/ hour)charger is in full working condition and used a lot. Stockton High Street great 50Kw fast charger and working.Used a lot but great for shopping. Spennymoor Green Lane council offices.7 kW and only does 20 miles an hour but one side is working. 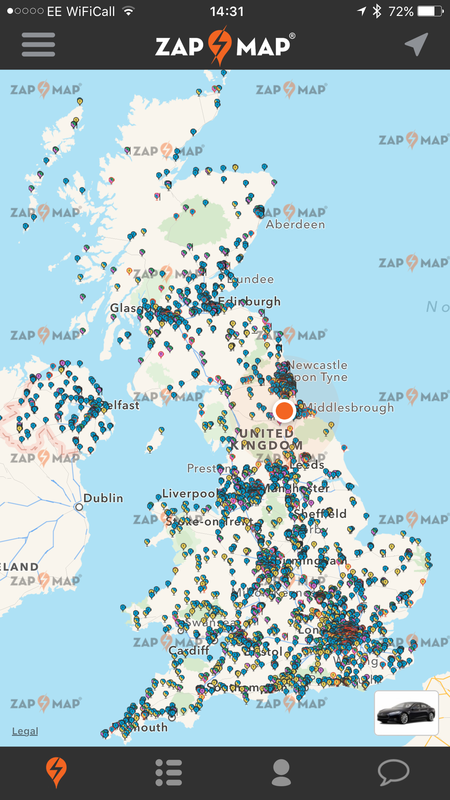 Used ZAP Map and found postings of users and zap admin very helpful and accurate to give me the state of Public Charging points. 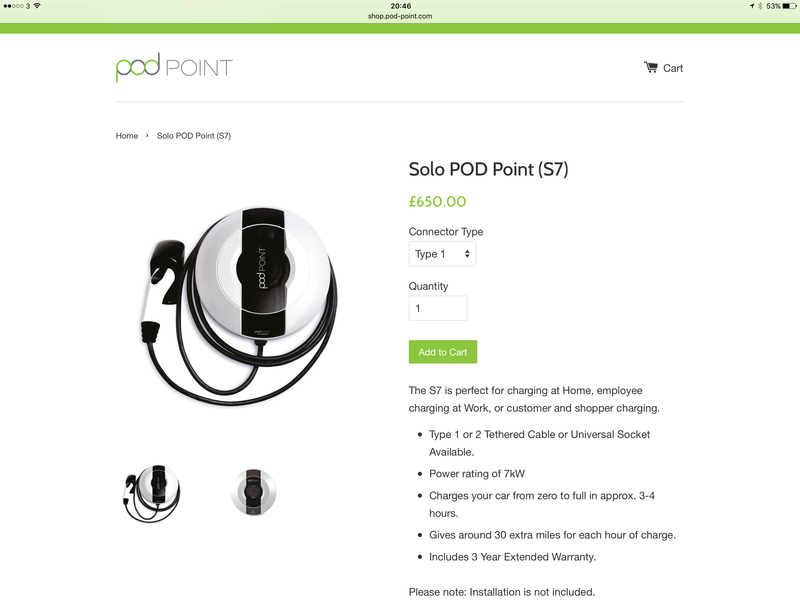 You still need RFID cards from Podpoint, ecotricity and CYC to get around the public charging points. Most of them are free and it’s like an adventure to find out about these charging points. Regular trips to Wales and always with a smile! 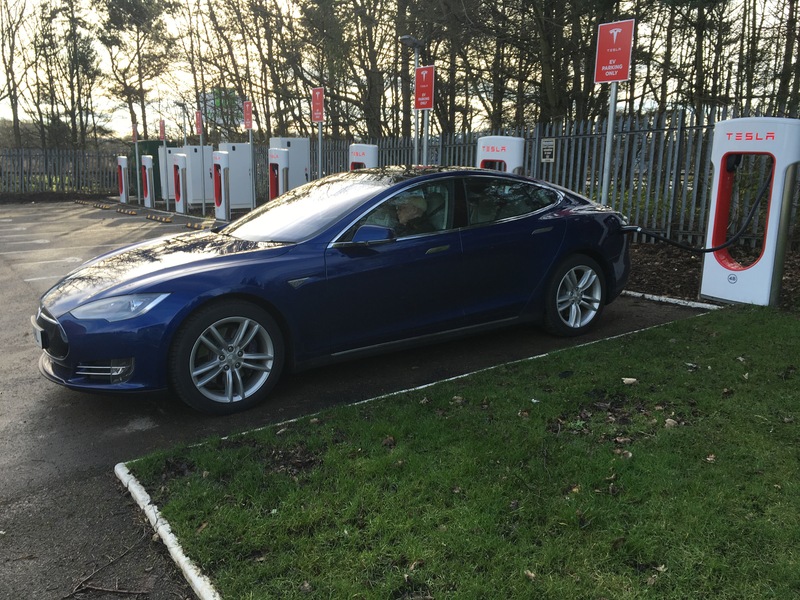 Well I have been to the Supercharger in Warrington now for the fourth time and it is still a joy.Its a busy old charging point.At 11:30 on a Saturday one of the charging stations is occupied by a white Tesla with black 21 inch wheels.Looks nice but my blue looks more sophisticated! This time we had a sandwich at the hotel and by the time we even walked from the car par to the lounge round a few corridors the car was already 30 miles fuller than when we left it!After 1h:10 the car was charged to 227 miles.Wow! Another record. 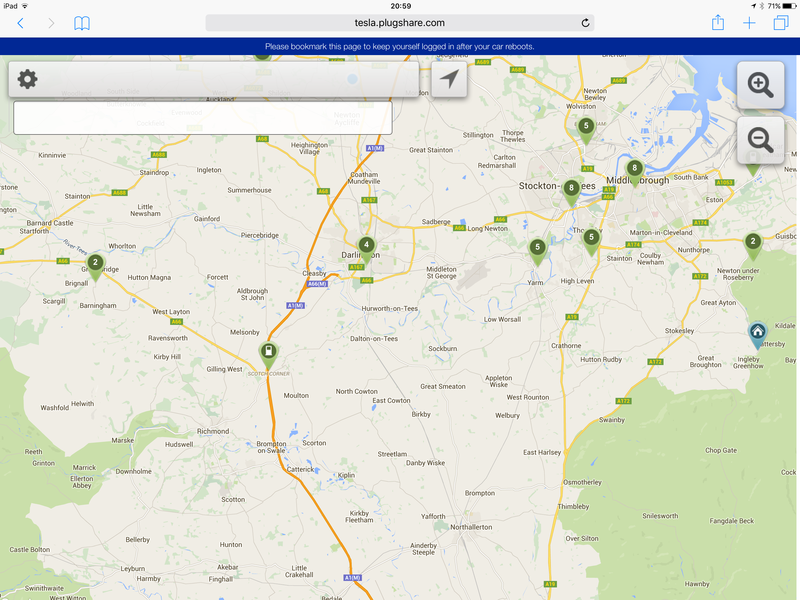 So off to Barnsley on Wednesday.We’ll see how the Tesla charging points in Yorkshire are. Today I impressed somebody again with the capabilities of a battery operated car.A friend of ours looked terrified and amazed at the same time when I accelerated from 0-60 in 5 seconds on an empty straight A Road.No wheel spin -no unsafe feeling-just sheer amazement at the capabilities-he said :I never knew an electric car can do this!He climbed back into his Audi A6 and still was shaking his head when he looked at the Tesla and he said again:What a beautiful car! 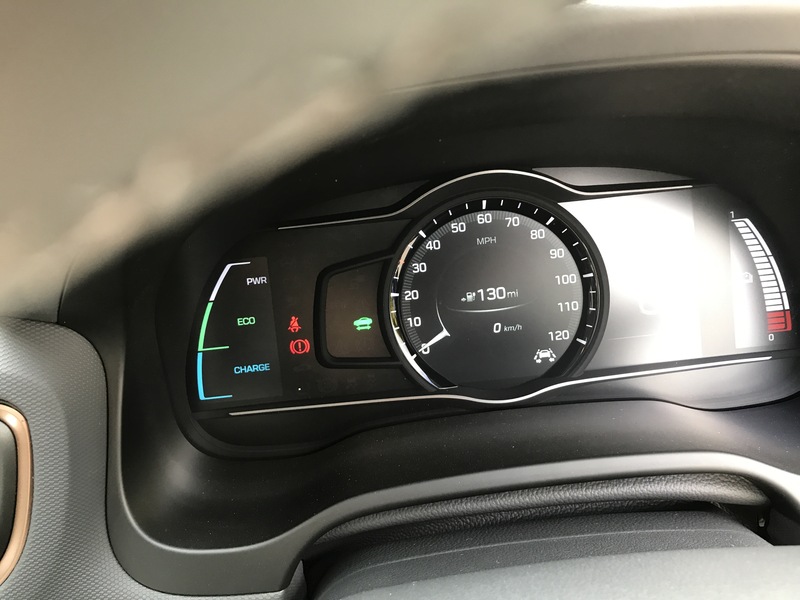 Other quotes were: What 2.8 seconds to 60 in a P90D -a battery operated car?I had no idea that this is possible on a car that cost less than a basic Porsche 911.Yes it has 750 BHP.About 500 BHP from the electric motor at the back and 250BHP at the front and it can still go for 270 miles at around 70 miles per hour.It almost can get you from Darlington to London on one charge.